We’d love your help. Let us know what’s wrong with this preview of Leading the Transformation by Gary Gruver. Leading-edge companies like Amazon and Google are applying DevOps and Agile principles to deliver large software projects faster than anyone thought possible. But most executives don’t understand Software is becoming more and more important across a broad range of industries, yet most technology executives struggle to deliver software improvements their businesses require. To ask other readers questions about Leading the Transformation, please sign up. Very practical advice for leading the DevOps transformation including setting busibess objectives, practices to adopt, progress measures, and culture change. The audience is senior managers who must improve the stability and throughput of software delivered by their organization. A practical guide for executives on how to apply Agile and DevOps principles to large organizations. This book is based on real-world experience at HP and it doesn't try to sugar coat how difficult such a transformation really is. They tell you up front that it took them 3 years, which is the right time scale for thinking about these issues. That's because it's not just about tossing in a few new technologies or techniques; it's about changing how people think, the goals of the organization, and A practical guide for executives on how to apply Agile and DevOps principles to large organizations. This book is based on real-world experience at HP and it doesn't try to sugar coat how difficult such a transformation really is. They tell you up front that it took them 3 years, which is the right time scale for thinking about these issues. That's because it's not just about tossing in a few new technologies or techniques; it's about changing how people think, the goals of the organization, and the company's entire culture. It's a slow and painful process, but one that's well-worth doing. * Don't try to "do Agile" or "do DevOps". These are techniques for accomplishing a goal and not goals in and of themselves. The goals you should focus on are the ones that are important to your business, such as increasing productivity, releasing code more often, increasing the stability of code in production, and so on. Once you have these goals in mind, you can then pick tools from Agile or DevOps to accomplish those goals. But don't forget that these are just tools, and that your ultimate end goals are something else. * Even once you've picked certain "tools" from Agile or DevOps, don't try to do everything all at once. For example, if you try to do continuous integration, continuous delivery, automated testing, trunk-based development, and 20 other DevOps techniques at the same time, then the project will become too large. Large projects require approval for large budgets; they require trying to prove that the project is a higher priority than other initiatives; they require going a long time without seeing any results or ROI; and most importantly, research has shown consistently that the larger the project, the more likely it is to fail. Instead, identify a small, incremental aspect of Agile or DevOps that will allow you to see improvements quickly. Implement just that aspect, which you can typically do with minimal approval, and allow everyone to see the impact it has. Then repeat the process again and again, each time biting off small chunks that each show an improvement. * Focus on getting feedback a) as quickly as possible that b) localizes the problem as much as possible to the actual cause. If it takes weeks or months to get feedback, a developer won't remember what code was responsible or that they were even the one to write it, and fixing the issue will take much longer. On the other hand, if you can get feedback quickly--say, immediately after the commit--then the developer will know exactly the cause, know for sure they were responsible, and will be able to fix it quickly. Moreover, they will learn much more from rapid feedback, and if they can run the same tests locally, they are more likely to prevent the issue in the first place. * Break tests into layers. For example, one layer of tests for each individual component; another layer for several components working together; another layer for the system as a whole. As you go up each level, the tests become more and more expensive (e.g. layer 1 may take seconds, layer 2 may take minutes, layer 3 may take hours). Therefore, you want to continuously identify "acceptance tests" at each layer that are most likely to prevent issues from slipping into the next layer. For example, if you see a test repeatedly failing in layer 3, that means you know how to test some particular type of functionality, but you're not doing it in the earlier layers. If this layer 3 failure happens often, then you may want to add a new acceptance test for this exact issue at layer 1 or 2, since those can catch the issue in seconds or minutes, instead of only catching it in layer 3, where it takes hours. * When converting a testing process from manual to automated, don't just script the exact actions you would take manually. For example, a manual test for a credit card payment web page may involve going to the website, signing up for an account, clicking a confirmation email, logging in, entering your credit card details, ..., 15 other steps, and then clicking a "pay now" button. If you create an automated test that does these exact steps and the test fails, you won't know if the cause is that the "pay now" button is broken or any of the 20 steps before it. Automated tests can be designed in a fundamentally different way than manual testing that allows them to provide not only faster and more reliable feedback, but also much more localized feedback that points to the exact cause. A better alternative for the credit card test would be to configure the automated test to run on top of mock data where the user already has the account fully set up so that all the test has to do is click the "pay now" button. If that test fails, you can be more or less certain that it's the button that's broken and not any of the 20 prior steps. The book does have some downsides. * Most of the chapters are very high level: there are relatively few concrete technical recommendations, no architecture diagrams, and nothing resembling a line of code in the entire book. Perhaps that's because they expect the target audience to be semi-technical executives, but without concrete examples, it's hard to know how to apply some of the advice. 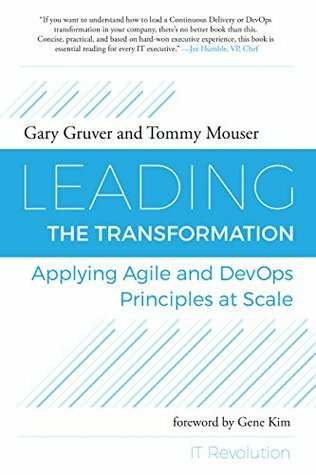 Having worked at a company that went through a similar transformation, I was already familiar with most of the terms, but I imagine someone new to the ideas of Agile and DevOps would struggle to use this book, as it lacks sufficient technical detail for how to put these practices in motion. Fortunately, it's a quick read, and at the end, there is a list of further reading which includes several books with lots of technical details. * Too many buzzwords. The writing sounds too much like managerial-speak, falling into the "kingdom of nouns" trap where they use a bunch of custom fancy-sound vocabulary (usually ending in "ion") instead of clearly expressing what they mean with simple verbs. A quick introduction to the core ideas around extending continuous improvement to software operations. By focusing on large enterprises it shows how concepts are applied outside the domain you might expect. The ideas are developed in terms of concrete business objectives. The explanations are very clear. They discuss the concepts that need to be evangelized to drive the shift to continuous development, rigorous testing, and rapid development cycles in a large organization and are clear about the A quick introduction to the core ideas around extending continuous improvement to software operations. By focusing on large enterprises it shows how concepts are applied outside the domain you might expect. The ideas are developed in terms of concrete business objectives. The explanations are very clear. They discuss the concepts that need to be evangelized to drive the shift to continuous development, rigorous testing, and rapid development cycles in a large organization and are clear about the benefits. A small book, it is a bit dense so it will take a little longer to read than one might expect. This book is a quick read, maybe a little too quick/efficient/terse. The main idea presented - that executives need to maintain a clear, ongoing set of business priorities that can guide enterprise-level DevOps and continuous delivery transformations - is well-taken, but they could have provided a more robust analysis/conversation that addressed some of the other factors that may have helped or hurt their own experience at HP. However, what I got out was well worth the time I put in. This book really focusses on the technical challenges teams run into when moving to continuous integration and deployment. It highlights the balance between the cultural and technical changes and the support of leadership. Highly recommend for people working in large organisations working with legacy code bases. Excellent executive level summary of Agile and DevOps principles. A good gateway drug to get the more resistant leaders in your organization to understand the imperatives and benefits for evolving your org. A quick and enjoyable read grasping the broad scope of how one applying agile and devops in larger organizations. Note that this book mostly covers the principles and not the details on how to apply it. I also liked that they had reference cases throughout the book to back their points. I liked the fact that the book focused on how to mature the environment to get to DevOps. Pragmatism and focus on continuous improvement rather than trying to force by the Agile book. If you are thinking about DevOps or you think you already it, important you check this book out. A nice summary of what it takes to turn around large-scale enterprise software development processes. If, like me, you are not a CTO of a large enterprise, you'll spend a lot of the book nodding in agreement and feeling like there's not a ton you can do about any of it without executive buy in. As far as the writing style, this was an excellent bed time read, so good, in fact, that it took me over a month to finish 100 pages. This book could have benefited from a proofreader as well. This is a very good book for executives leading organizations and businesses whose primary function is software development. Hats off to the authors for discussing pragmatic ways that large traditional organizations can employ when making the turn to agile operating principles. As a transformation consultant, this is my new go to recommendation for executive leadership. This book is a quick but detailed read on how and more importantly why companies perform agile/devops transformations. This book was exactly what I was looking for and I highly recommend if you're an executive or manager planning or pondering this change! Really interesting book for senior leader wish to bring improvement in their development cycle. The transformation approach is really interesting. A good summary on moving from Waterfall to Devops company-wide . Based on the author experience at HP's Printer Division.